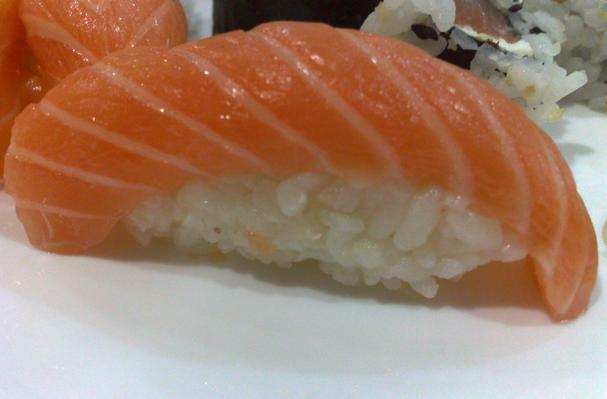 Slice the fish into paper thin slices the size of your mold for the sushi. Using a tablespoon measure dipped in ice water, mold sticky rice and pat down in the measure. Tap on a wooden board to loosen the rice and place on the cutting board. Continue until all rice is used. Place the sliced fish on each rice mold and decorate with pickled ginger, cucumber, or any other bits of vegetable you have from other sushi you are preparing. Serve with wasabi, pickled ginger, and soy sauce. This recipe yields 16 pieces.